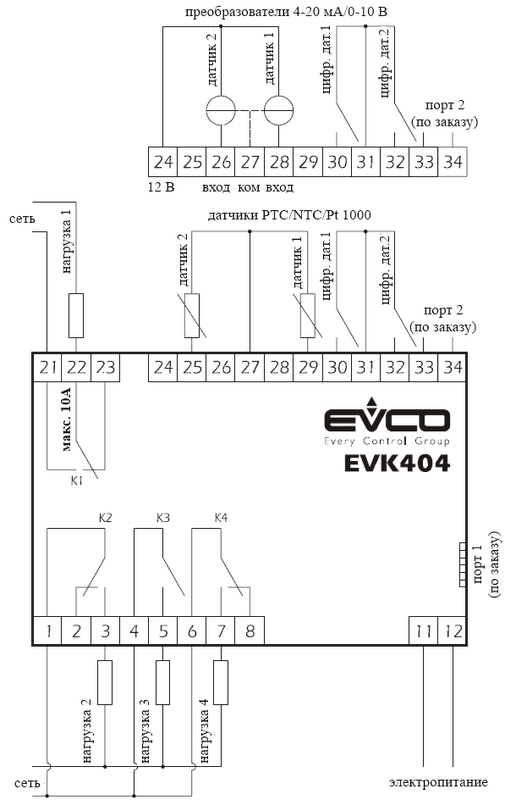 The main area of application of EVK404 series controllers-refrigeration, heating, air-conditioning, climate, as well as other common industrial equipment. All models in this series are fitted with two universal analog inputs for measuring transducers (sensors NTC/PTC/PT1000/4-20 mA/0-10V), two digital inputs (free), as well as four electromechanical relays (16A-8A-8A-8A). Custom controllers can be equipped with an audible alarm, serial port, TTL/ModBus, as well as additional access under remote display or temperature indicator. Connection: screw terminal blocks (power cable exits), removable terminal block (inputs), 6-way connector (serial port), removable terminal block (the remote pointer; optional), removable spring-loaded terminal block (power cable exits) on request. Ambient temperature: from 0 to 55° c (32 to 131° F, 10 ... 90% relative humidity without condensation). Power supply: 12 Vac/Dc (or 12-24 Vac/Dc), 50/60 Hz, 3.5 BA or 115-230 Vac, 50/60 Hz, 5 VA (approximately).